The right side of the brain is associated with cognitive skills such as creativity, emotion and intuition. The dreamers and the artists of the world, of which we all have the capability to be. The steadfast hustle of modern day society tends to get in the way of allowing us to tap into creativity, passion projects and intuitive pursuits that get us back to doing things with our hands and our hearts. For this reason, that's why we love offering various workshops that provide this community with opportunities to do just that. To step away from the screens for a bit and indulge ourselves in the right brain. And in our opinion, there is no better way to do that than spending some quality time in the kitchen approaching recipes with a creative and intuitive mind. That food then becomes the nourishment that feeds our bodies and our bones with some tender loving care, and the opportunity to share those meals with our loved ones. While we like one-off some recipe variations of our own, we typically look to others that specialize in this craft for inspiration, and then do it up as we wish. We love a foundation to work with, while still making it our own in a way that caters to our personal preferences and needs. Visiting local farmer's markets and independently owned local grocery stores allows us to take advantage of seasonal abundance, and along the way we usually find some rare gems that inspire our next meal (re: fiddleheads, garlic scapes, hen of the woods). We recently revisited a few of our favorite bookmarked recipes that we've found to be some of the most wildly creative plant-based recipes that offer deep nourishment. Using these as inspiration, we offer some hints as to how we'd make it our own, hoping that they, too, inspire you to tap into your right brain to view nourishment as an opportunity for creativity. Complex carbohydrates provide the brain with a steady dose of glucose throughout the day and take longer to break down and can be better regulated by the body and the brain (versus simple carbohydrates like refined sugars and flours). Consider oats, quinoa, brown rice, millet, amaranth and spelt. Essential fatty acids are crucial for proper brain function, to help process information and support creative thinking and problem solving. Try foods rich in omegas, including hemp seeds, chia seeds, flax seeds, walnuts, avocados, olive oil and coconut oil. Antioxidants protect our cells from free radical damage while helping to boost immunity in order to prevent us from becoming ill. Berries, citrus fruits, dark leafy green vegetables, yams, squashes, raw cacao, spirulina, maca, bee pollen and green tea are all wonderful staples to keep around in abundance. Another genius creation by the ladies of Laka Living that combines two herbal powerhouses (matcha and pine pollen) into an indulgent yet nutritious breakfast loaf for sustained energy, creativity and arousal. To enhance the experience, we'd add freshly sliced bananas or strawberry and then drizzle the Chocolate Pearl Drip on top (with a bit of extra matcha dusted on top). 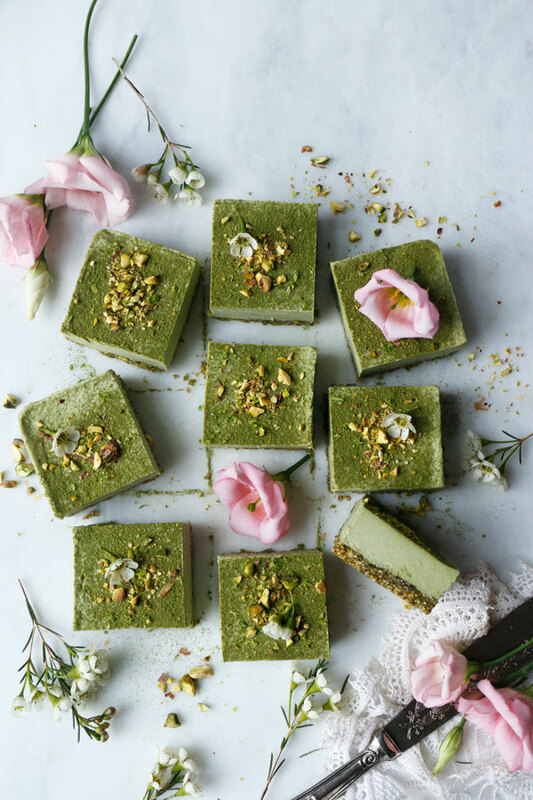 And to be resourceful with ingredients, we suggest making a homemade matcha chocolate milk to store in the fridge and sip on throughout the day, especially after being out in the summer heat. A summer-friendly variation of a classic by Tonya Papanikolov of The Well Woman that utilizes seasonal abundance and fresh herbs, leaving you room to be creative with toppings (such as nasturtium, chantrelles, ramps, etc). Utilizing these same ingredients for another dish, we suggest making a cauliflower risotto with the leftover pesto, mushrooms and herbs, or double the ingredients to create flatbread bites or croutons to toss with summer salads. Wholesome and divine little bites by Hana of Nirvana Cakery that are a fusion between high protein superfood bars and raw dessert. Moringa is a cellular powerhouse, while puffed amaranth keeps the recipe interesting, along with pumpkin seed butter for that lovely green color. Because this recipe calls for homemade pumpkin seed butter, let yourself take a break from traditional nut butters and batch a jar of pumpkin seed butter to spread on loaves, fresh fruit, toss into smoothies or eat by the spoonful for something different. Keep the Moringa around to toss into tonics and elixirs to cleanse, cool and purify the body. A beautifully paired indulgence by Laura Wright of The First Mess to enjoy over coconut yogurt, morning oats, or even summertime salads and greens for some good crunch. We'd add a touch of maca and rosewater to the mix and then maybe drizzle with a bit of homemade salted caramel for a dessert-like breakfast. To keep things sustainable and limit the use of plastic and paper bags, collect glass jars to take on your grocery trips to buy these ingredients in bulk, and store next to your apothecary staples to encourage creativity for a new granola base each time you batch it. A cooling dairy-free indulgence by the lovely Renee Byrd of Will Frolic For Food (see her recent Boketto Moment feature here) that takes a childhood wonder (magic shell) and evolves it into a healthy creme-based shell garnished with edible flowers, seeds and whatever else you fancy. The white chocolate magic shell doesn't necessarily need to stay true to these popsicles. Make a large batch of it to keep around for a topping to homemade ice cream and sorbets (just frozen fruit and whatever else in the food processor! ), to swirl into melted cacao for raw chocolate bark or to melt on top of hot morning oats. Possibilities are pretty much endless. We also love the creativity woven through the artful recipes found in The Moon Juice Cookbook as well as High Vibrational Beauty, including Strawberry Rose Geranium Jam, Tonic Youth Pesto and Hibiscus Horchata...among so many others.